One of the ambitious and promising projects of the late President Ferdinand Marcos is the Anti-Typhoon Rockets to prevent storms. In a nutshell, it primarily works to weaken typhoons. Philippines as one of the flood and disaster-stricken countries as recorded, surpasses more than 10 typhoons each year. The strong typhoons like Yolanda, Ondoy, and Ompong as the latest have left some of the country’s provinces and cities under the state of calamity and so much damage, flash floods and landslides to enumerate some. Looking back on the Martial Law days, 1973, a Rain Weather Stimulation and Modernization Program” was created. Coming from a reference, Lucis Philippines, records of newspaper files detailing the project is presented. 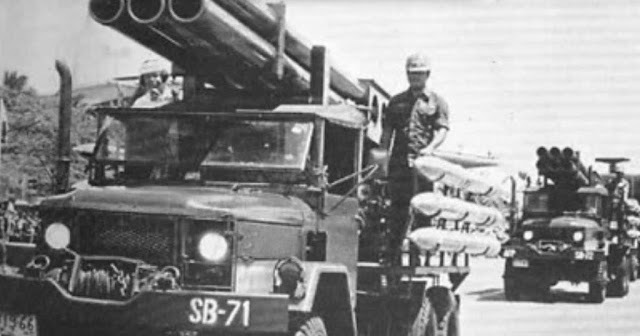 Though this program and its trial results aren’t much known to the public until today, it is said that its objective is to equip the F-5 Freedom fighters to successfully throw silver iodide to the brewing storms that will directly approach the Philippine Area of Responsibility. With its success, upcoming typhoons will weaken its strength thus lessen the damage it can inflict in the country. However, it did not push through. The project was led by Col. Ramon Macabuhay of Philippine Airforce. 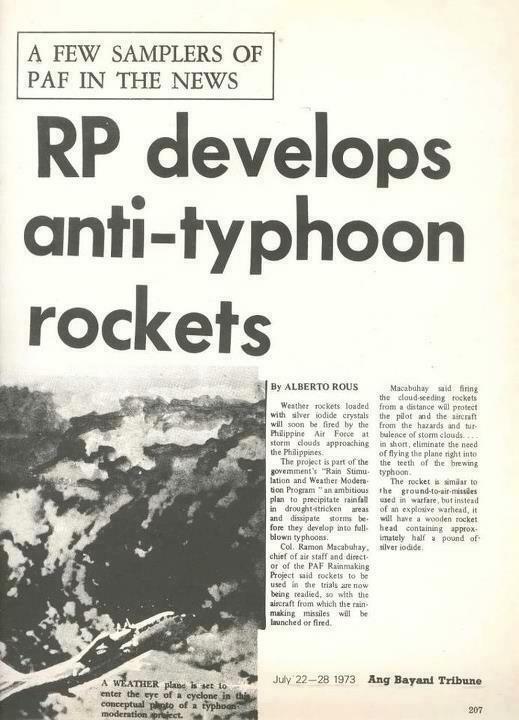 The anti-typhoon rockets are said to have similarity to missiles that are typically used in warfares, according to Manila Live Wire. The half pound of silver iodide that will weaken the storm clouds is placed in the rocket’s wooden head, ready to be fired. The AFP had the simulation for this where pilots are trained to be equipped in such a time of need. 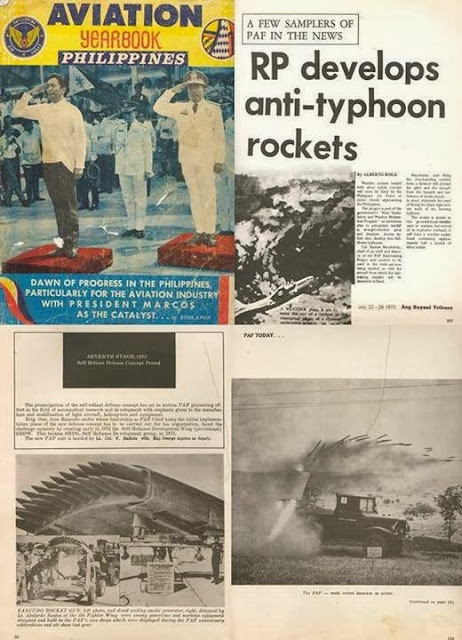 Marcos, as one of the President’s to aim high and uplift the country as one of the economy tiger countries in his time had several projects that are now forgotten. Most are engaged in the military equipment and inventions that could greatly help the country and put into a pedestal.